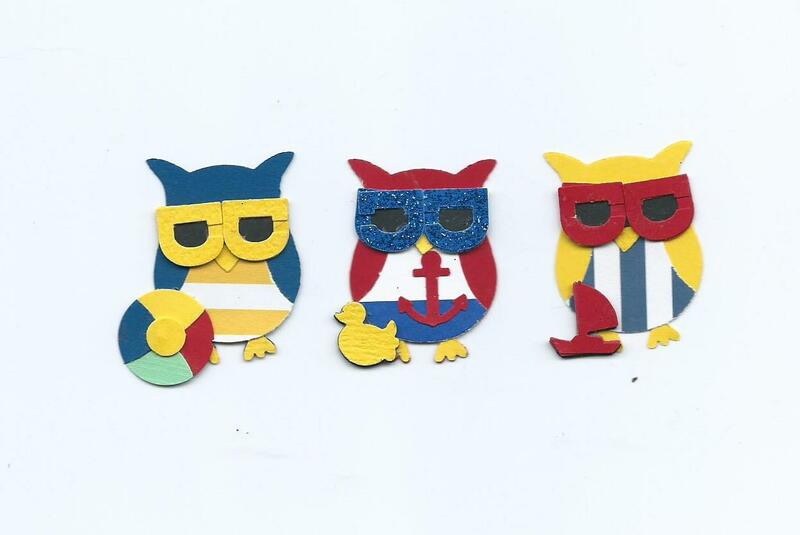 Here are the really cute mini sunglasses punch art I designed for my Stampin’ Up Owl Builder Punches that I decked out for the beach because what self-respecting owl would be seen dead at the beach NOT wearing some shades? Glue two “D”s together so that there is no gap. I used two different colors for emphasis. Of course if your letter punches are solid you don’t need to do this. Glue the circle punches to the backs of the sunglasses. Glue the rectangle punch to the back of the sunglasses. After they dry your sunglasses are ready for use. My Stampin’ Up Owl Builder Punches All Decked Out For Summer! I admit to being a little obsessive about punching out cute little owls with my Stampin’ Up Owl Builder punch. They’ve all come out cute but I just HAD to share my little owls in their summer garb. 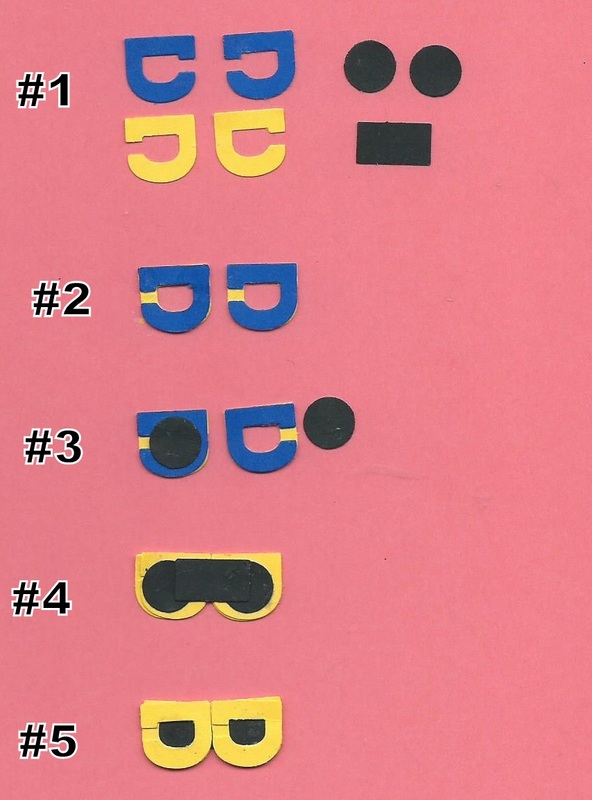 I promise to share how I made their sunglasses (from 4 letter “D” punch outs) soon and I’ve already shared the beach ball punch art. This one is made in the same way – only the heart and the circle punches I used were smaller. Thanks for taking a look – let me know what you think. And why not share your summer clad owls with me. I found these cute seed packets on clearance for TEN CENTS at the local dollar store and just could not resist them! I really did not have an idea in mind but after a little thinking I came up with a way to use them on my seasonal garland. Of course this would be just as easy to make the ornament with a spring or summer theme. So save those empty seed packets from the trash and up-cycle them to a new life on your seasonal wreath or tree. Empty the seeds from the packet. I am saving mine to be planted per the package direction. Glue the seed packet to a piece of cardstock and allow to dry. Cut around the packet leaving a 1/4th to 1/2 th inch border. 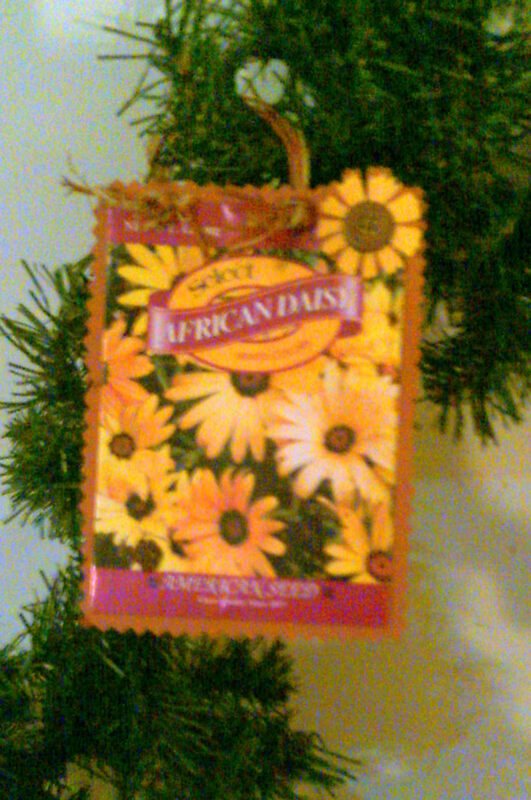 Punch two holes in the top of the seed packet and attach a raffia hanger. Punch two cosmos flowers from contrasting cardstock. Glue the two punches together and attach a button to the center with a Glue Dot. Bend the petals of the upper punch up around the button. Attach the flower to the seed packet. I love autumn best of all the seasons. It’s always been my favorite time of the year and I only truly feel alive when there is a nip in the air. Living in Louisiana all my life I THOUGHT the fall leaves were beautiful, but it wasn’t until my husband and I lived in Virginal for a while that I made my first trip to the mountains and discovered how colorful fall leaves really are. Subsequent visits to the Ozark, Ouachita, and Smokey Mountains proved equally colorful. It’s been a while since I’ve last visited the mountains – illness has prevailed both physically and financially – and I have no hope of visiting them soon but sometimes when I drive through a hilly (for Louisiana) area I pretend I am in the mountains. Right now pretending and creating fall crafts will have to be enough. So I present to you this Rustic Burlap Pumpkin. I am using mine as an ornament for my Fall Garland but you could use this on a greeting card or a scrapbook page or even frame it for a cute fall wall decoration or use it as a package decoration for a fall gift. 1. Assemble supplies. I used two shades of natural burlap for my pumpkin. This just adds extra dimension to me. Technically the darker shade should be on the “rear” of the pumpkin and the light on the “front”, but I just like it the other way around. You could also use orange burlap for the pumpkin, but I did not have any on hand! I used brown burlap for the stem, but green would also look swell! 2. Freehand a base pumpkin shape, an oval center, and a stem on cardstock. I used orange for my pumpkin as the light colored burlap lets the orange bleeds through adding an orange tint to the pumpkin. 3. Check for fit and trim to fit as needed. 4. Glue the cardstock pieces to the burlap with fabric glue. I used a bamboo skewer to apply the glue. It’s easier to clean than a paintbrush. 5. When the pieces are dry cut them out. 6. Define the edges of the pumpkin. Draw widely spaced stiches with an orange Sharpie. An alternative is to whipstitch the edges with a DOUBLE STRAND of embroidery thread. I choose to combine the two methods. 7. Glue the stem on the pumpkin shape. I did not define it but if you use natural burlap you could edge it in dark brown. 8. Curl short piece raffia around your bamboo skewer. 9. 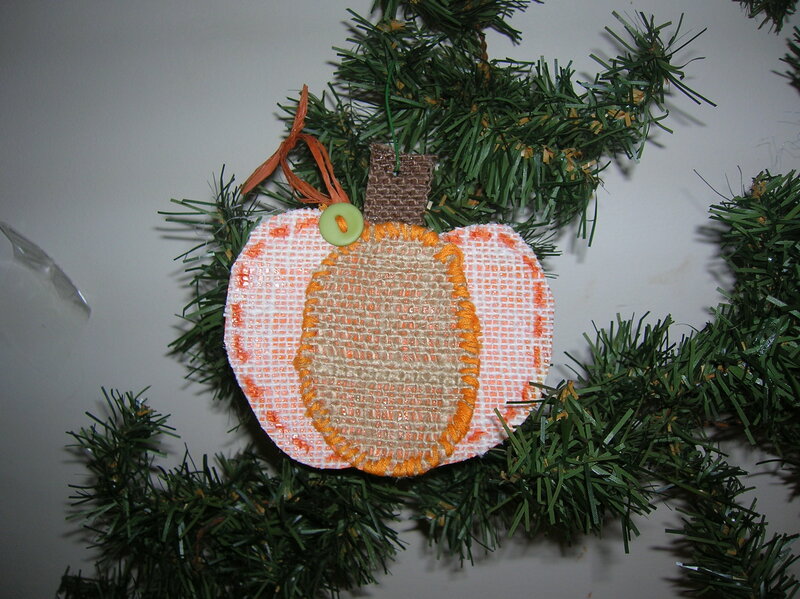 Glue the raffia to the stem then glue the oval to the pumpkin adding dimension. Sew a green button on for a leaf. Here is my second pumpkin made with white cardstock. I might like it better! THANKS SO MUCH FOR TAKING A LOOK. PLEASE LEAVE ME A COMMENT. I’D LOVE TO HEAR FROM YOU! I wanted to do a little something different, kinda multimedia-ey, with a package of really cute fall silk leaves I picked up at Dollar General. This ornament was inspired by the stitched hearts I am making from an old, literally falling apart, quilt and one of my last year’s Christmas projects involving gluing shapes to paper bags. So looking at my bag of leaves I thought “Hey, why not combine the two?” and thus this ornament idea was born! While I was stitching I was reminded of the Doctor Who episode “A Good Man Goes to War”. In this episode a human female “Order of the Headless Monks” solider hailing the Gamma Forest stitched a prayer leaf (a good luck token) for the kidnapped Amy’s newborn baby girl, Melody Pond. The solider, Lorna Bucket, only joined the order’s army in an attempt to meet the Doctor, who she met as a child, once again. She later goes to warn the Doctor’s Army of treachery and fights with them but is slain. It doesn’t really resemble the prayer leaf much but just somehow the hand – mind connection was firmly established while I was stitching! Maybe it’s just the time immortal figure of a woman hunched over her sewing placing well wishes for the recipient with every stich taken. 1. Assemble supplies. Select fall colored craft materials (thread, ribbon, trim, etc.). 2. Apply fabric glue to the back of the leaf with a bamboo skewer. I find a skewer easier to use to apply glue than a paintbrush which gets all gummy. 3. Use the skewer (or your fingers if you don’t mind “glue fingers”) to press the leaf onto the paper bag. 4. Cut and glue a stem from brown cardstock if desired. After the glue dries trim the bag close to the edge with pinking shears. 5. Use the needle to punch holes in the silk leaf about 3 mm apart. It was a little hard for me to push the needle through the layers and pre-punching the holes made the stitching super easy! 6. Whip stich around the leaf with contrasting thread. Use short pieces of thread to help reduce tangles. 7. When rounding the corners place several stiches in the same hole so the corners look more “finished”. 8. To tie the short end of the thread off leave the loose thread on the back of the leaf. Then leaving a short “tail” place a few stiches with the new piece of thread. Then tie the two thread ends together. 9. Make a bow with a torn fabric strip. Then secure the bow “shut” by sewing a button in the center. 10. Punch a hole in the stem of the leaf and tie on a strand of thread for a hanger. After the bow is attached sew the buttons on with contrasting thread. 11. In this example I did not leave a stem so I sewed a loop of rick-rack directly to the top of the leaf for the ornament hanger. I love this craft because there are just so many ways to go! Make a dozen of the same style or twelve unique ornaments! Thanks so much for stopping in, and as always I love for your comments! 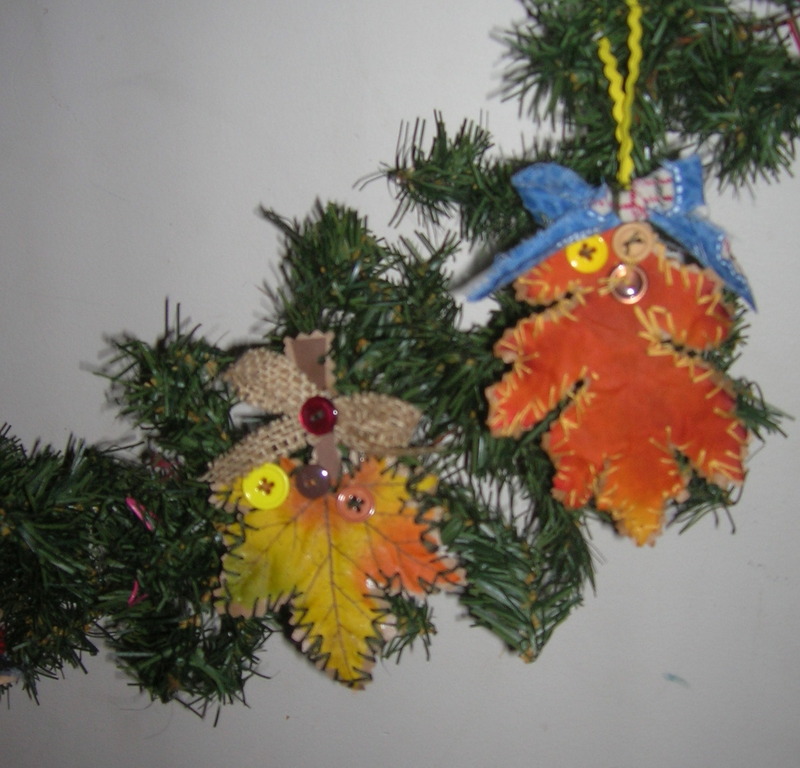 Here is a craft idea for those who have a need to do a fall craft project with multiple children. Oriental Trading sells these kits for decorating a “Scarecrow Pumpkin”. The unit has three different designs. Look in the “less than perfect” section and you can get 12 kits for about $2 and SHIPPING IS FREE thru this THURSDAY for any size order!!! Enter key code WCE3585 during checkout. If you buy these clearance kits you may need to use your own glue as the adhesive may be dried out – but hey, for $2/12 I can use my glue!!! Instead of using a pumpkin I purchased dinner size orange paper plates at Wally World I think 20 for $2. 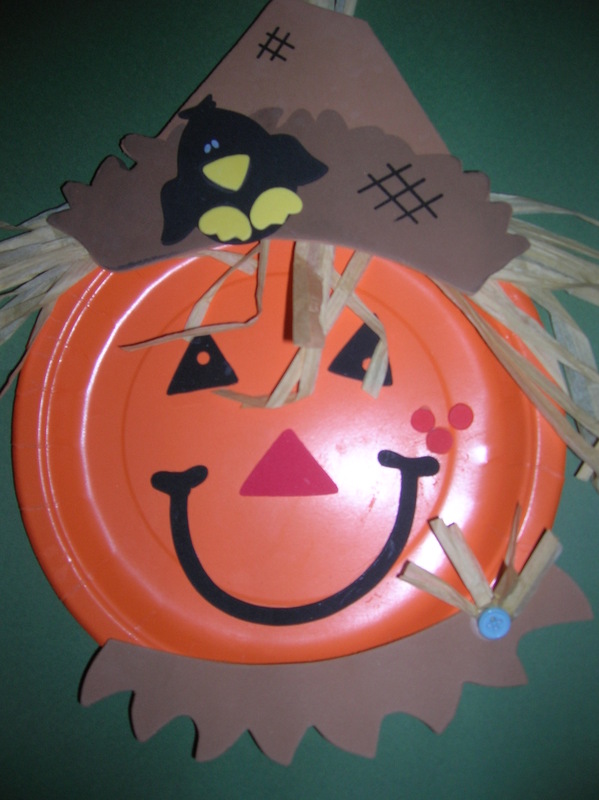 You could also use yellow or buff paper plates to make him more scarcrow-y and less pumpkin-y. Attach a hanger to the back – glue on a soda pop ring a loop of ribbon or other hanger to the back so he can be hung as a cute handmade by your kid fall decoration!!! I added the button and wouldn’t he look cute with an addition of buttons on his eyes? You could also add silk fall leaves, foam fall leaves, and other fall-ly craft items to make your plate unique! So this works out to be a pretty cheap project for a children’s group to do. 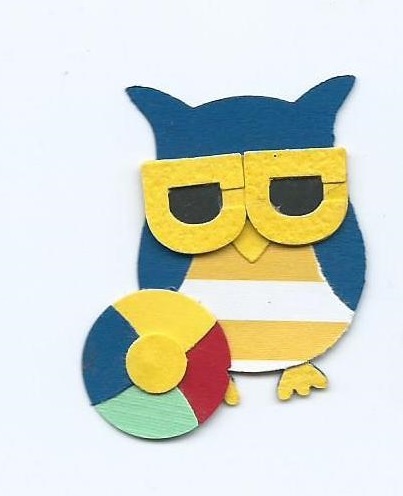 And if you just need to make one project you can hand cut your pieces from craft foam or construction paper! This garland designed for the kiddies to complete came about this past Sunday when I was drafted volunteered to help out during the Extended Care Session for preschoolers (a.k.a. 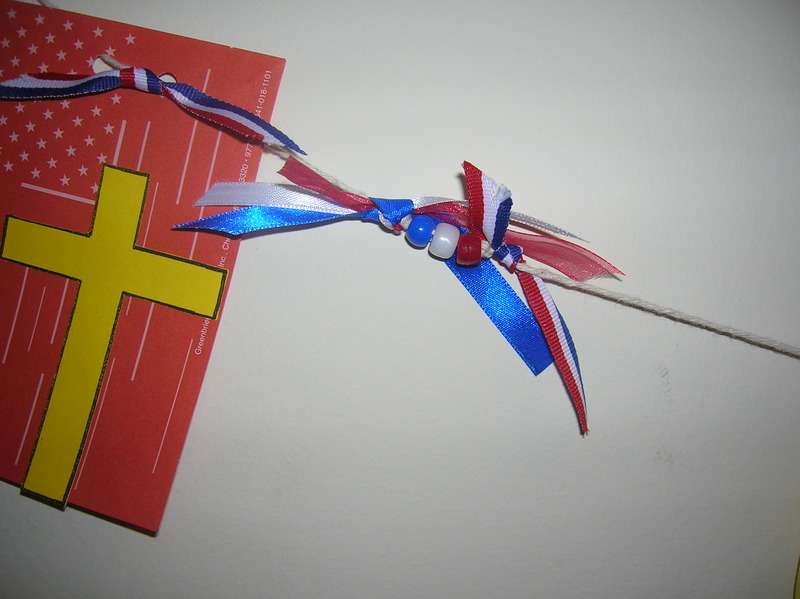 Children’s Church) and had to come up with an emergency patriotic craft project for the Fourth of July. I quickly came up with a project using items from our craft closet that takes about 20 minutes to complete. 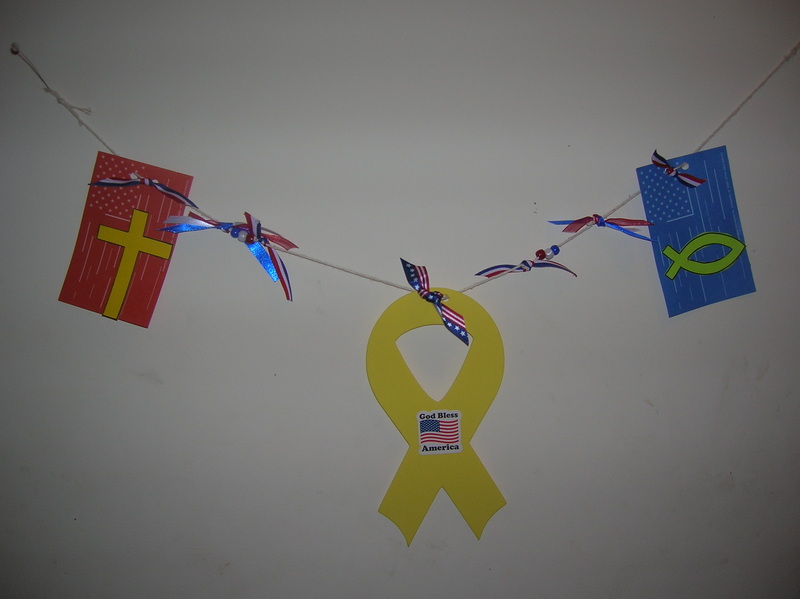 The lesson to go along with this craft focused on the yellow ribbon symbolizing remembering our soldiers, the flag symbolizing our freedom, and the “God Bless America” & other religious “die cuts” our freedom of religion. We talked about children in other countries who could not attend church at all or those who did so with the possibility of being arrested. 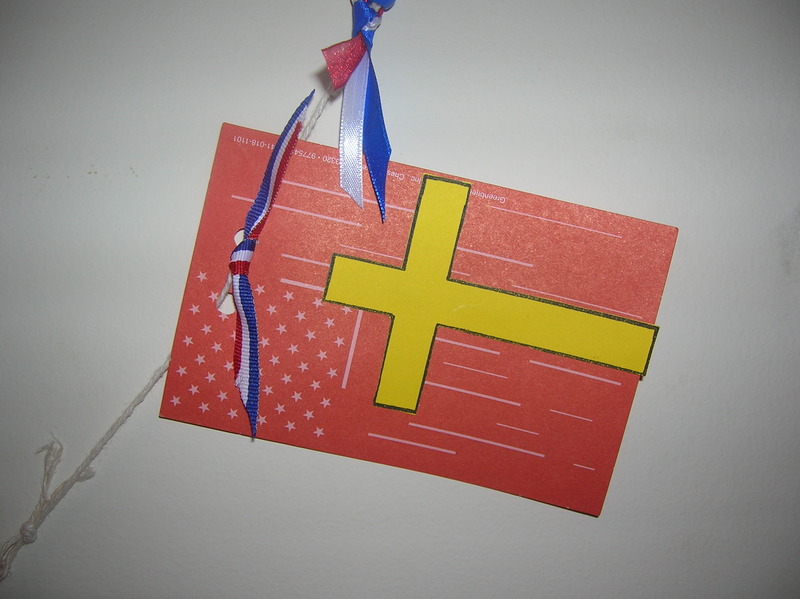 This would be a great kid’s rainy day craft project for any patriotic holiday or an easy patriotic holiday decoration by varying the paper and foam die cuts used (i.e. ; George Washington or Abraham Lincoln silhouette, stars, etc.). You can also make this as long as you want. I choose to keep it short due to time constraints and to prevent tangling as the children carried it home. When you string the paper and foam items make sure the loops are in the front. To secure the paper or foam items in place tie a ribbon through the loop. Thread the beads on the twine and secure them in place with a short piece of ribbon. 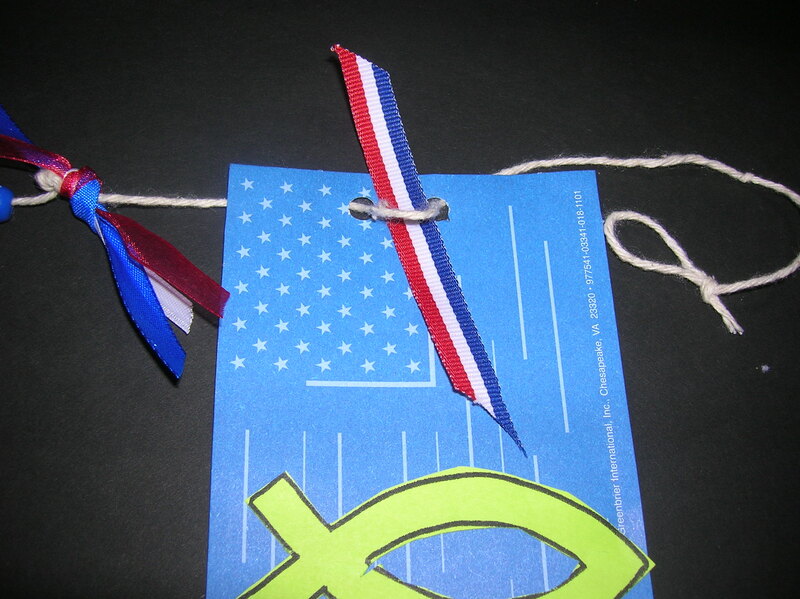 Glue a cross and a fish on the flags if desired. The garland displayed on the wall.